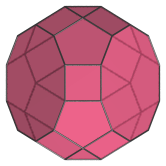 The metabidiminished rhombicosidodecahedron (J81), also known by its Bowers Acronym mabidrid, is the 81st Johnson solid. 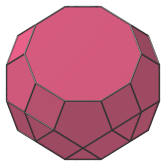 It has 50 vertices, 90 edges, and 42 faces (10 triangles, 20 squares, 10 pentagons, 2 decagons). 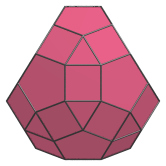 It can be constructed by removing 2 pentagonal cupolae from the rhombicosidodecahedron such that 2 non-parallel decagonal faces are formed. Due to the non-equivalence of its vertices, the metabidiminished rhombicosidodecahedron only has a single axis of symmetry: a 2-fold symmetry around the line passing through the top and bottom square faces. 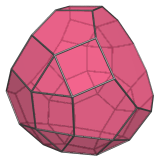 It is a diminishing of the rhombicosidodecahedron in an analogous way to the metabidiminished icosahedron (J62) being a diminishing of the icosahedron. Top view, centered on square between decagons. Front view, showing its wedge-like shape. Cartesian coordinates for the metabidiminished rhombicosidodecahedron can be obtained in at least two different ways: by deleting vertices from the rhombicosidodecahedron, or by constructing a series of appropriately-scaled triangles and hexagons on parallel hyperplanes along its 2-fold axis of symmetry. Last updated 09 Mar 2019.